These innovative headphones will work with iPhone, Samsung, HTC and Nokia smartphones. Listen to music from your computer or other wireless device, or make/answer calls seamlessly. 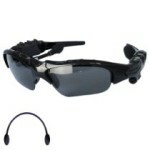 The wireless bluetooth sunglasses are black polarized lenses which can filter light and protect your eyesight. If using indoors, the sunglasses will flip up. The earphones are built directly on the frame and can be adjusted to fit. The sound produced by the earphones is high-fidelity, CD quality sound. Of course, the best use for this product is sitting on a beach with your smartphone handy, listening to your favorite music and seamlessly switching between music and phone calls (unless you have put your phone in vacation mode and aren’t taking any calls). This external hard drive is small enough to carry along with a notebook or laptop. Or leave it at home connected to your PC and access and share content from any device anywhere via the internet and mobile devices. Also back up content from your mobile devices using the internet or a home Wi-Fi network. It provides a complete backup solution for protecting your digital memories with a simple and intuitive user interface. For extra protection, secure your backups with password protected data encryption. This all-in-one printer is simple to use, easy to set-up, and a great bargain. It contains a 2.7″ TouchScreen color LCD display plus TouchPanel for interactive menu navigation. It is rated to print up to 33 pages per minute in black and 27 pages per minute in color. Print directly from a USB or mobile device, or scan items to the cloud with pre-installed Brother Cloud Apps. The printer is equipped for automatic duplex (two-sided) printing. The compact size of this printer makes it ideal for use in a home office. And the paper tray will hold up to 100 sheets of paper. Coming soon, Amazon Fire Phone!